The ultimate tabletop parrot stand for large parrots such as grey parrots, amazons and cockatoos! 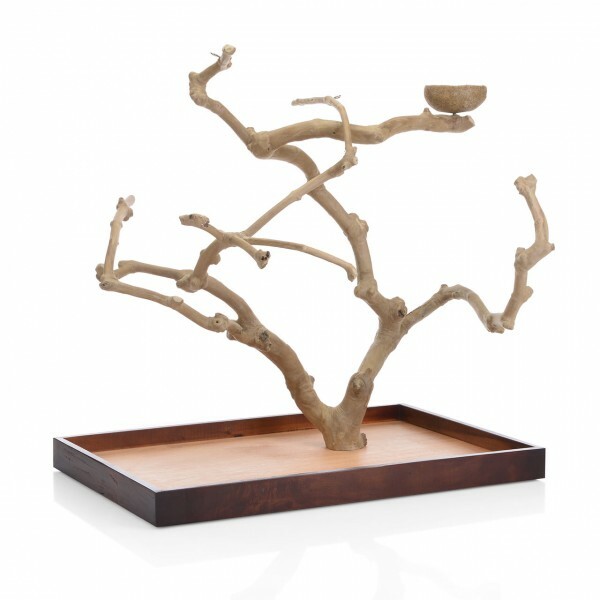 This trees of coffee wood from the island of Java offer a unique kind of parrot tree to your beloved bird.The extremely hard coffee wood has been blasted properly and dried. The set contains tree and platform which both will be fixed together. Your feathered friend will enjoy the many variations of climbing and playing on this natural piece of wood.. Diameter and design of perches may vary due to natural origin. links "Java Tree Tabletop from coffee wood - L"
customer reviews on "Java Tree Tabletop from coffee wood - L"
Meine beiden Grauen haben es schnell erobert. Tolles Produkt, sehr stabil (etwas höher als erwartet) und meine Amazonen lieben es. Ein super toller Kletterbaum. Viele Äste zum klettern. Spielzeug dran und schon kann sich der Vogel austauben. Schöner, stabiler Kletterbaum. Muss aber vorsichtig an Bodenplatte geschraubt werden, das das Holz leicht reißt. Ist aber gut machbar.